Rated 5 out of 5 by misty7737 from Impressive It's clear a lot of thought has gone into the gameplay, from designing menus to the layout of the restaurant and the staff that work there, most of what I wanted was there. It's a great game and I'd definitely recommend it to people who like management roleplays. Rated 5 out of 5 by Married2aBMXer from Best game I've ever played Loved everything about this game. Rated 5 out of 5 by eesha from Quirky Restaurant Tycoon Game I love tycoon games and I love cooking so this one is perfect but be ready to invest time in learning how to play. You also need to have an interest in running a restaurant business and keeping customers satisfied. The graphics are so so but there is enough variety and challenge that I have played this many times over several years. You get to furnish and decorate restaurants, pick recipes, adjust the prices, hire and fire workers and work to improve their skills. There are also cooking challenges of a sort although I found these a bit annoying. Rated 5 out of 5 by tazfn1 from Best game on all BFG I have had this game for a few years now. I have been a member on BFG since like 2008, so I've played a LOT of the games here. What I love about Restaurant Empire is that I keep coming back to it. Anyway, in my opinion, this truly is the best game BFG offers because it is also the most unique. In every genre of games you can find a cookie cutter copy of any hit game with a few minor details changed. This game at least is truly original. I think that's why I keep coming back. It's refreshing. I love that there is a great deal of strategy involved, from menu pricing, recipe quality, what recipes you can serve, quality of service, quality of decor, and even if your stats are perfect (i.e. service, atmosphere, food, pricing) you will still get dinged because your restaurant is so good, people are getting turned away due to lack of seating! I know this sounds like a no win situation, but think of the valuable lesson this teaches us... there is no perfect scenario and sometimes your best is as good as it gets. Rated 5 out of 5 by bubblewrap123 from Awesome! If you're into mindless games you can learn in 5 minutes, this game is not for you. You won't completely learn the game in your free 1 hour trial. There is even strategy in decorating your restaurants. As the game progresses, even more components are added. Many, many different aspects to this game and games within the game. Steep learning curve, but weeks and months of entertainment here. One of the best I've ever played. Rated 5 out of 5 by quillfred from Favorite of All Time Restaurant Empire is great! It requires patience for learning the systems but more than rewards in the end. Rated 4 out of 5 by khendrick1 from Awesome Game I have loved this game for years. I bought it on disc but lost it so I'm glad to be able to get it here. I just wish BFG would offer us the sequel. Rated 4 out of 5 by jpinak from Love the Game, But Has Its Issues Lots of glitches, but it is fun and detailed. Not for the point and click and learn in five minutes type of player! Rated 4 out of 5 by Summertime121 from Always fun! I love this game! It has never been so fun to run your own restaurant. This game is really worth the money! It's a good storyline, you have many options are provided to do and it remains just plain fun. Cons: I still think you have a very bad unfinished tutorial gets. They were a little more time to spend because you're the most self-invent, like people that start with the sandbox option. They get no tutorial. That is quite a drawback. But otherwise, I love this game so bad! This is truly a must-to-play game. Rated 4 out of 5 by gingergal from A sims type game but not without problems Do you like sims type games? Although I like 'the sims' it does frustrate me that I have to feed them, see they are rested etc when I just want to get on with the game. Here in this game you don't have that problem (horrah!) They seem to be automatons - not needing breaks etc. This has the same look/graphics of the original sims. Somehow I really got into this game- just got addicted to it. But like any sim type game, you can't pick it up and play for just 30 mins at a time. But I would say, that those that like pure sims games may be a bit frustrated at the lack of control (see above) of making them eat etc. It's not that kind of a game! It's all about making your targets, seeing customers are happy, making profits, winning cooking competition etc. I do think you need a walkthrough purely to give you tips on how to play this game and hints. I was lost at the beginning but hours into it, I got it. There is in built tips which does help but not fully. If you have time to invest, then you may like this. Tips - click on everything - customers, menu etc. Even if you manage to do all the tips - it's not 100% you will still get customers not happy - I guess that's life! I prefered restaurant 2 (not here in BF yet) it has more choice in furnishing, type of restaurants, food and even has a cake shop. It also gives you this original game free. I played this game first but I'd recommend you getting the 2nd game. In all though it's still a fun playable game! Rated 3 out of 5 by alay93 from lovely this game great for me. . . . . Rated 3 out of 5 by jordeniche from Wanted to like, but far too 'buggy'... Great concept, just too many bugs and design flaws which made gameplay awkward. (Did discover the distributor's direct site which has *patches* for those who purchased from them.) I'm hopeful that R.E. 2 has the kinks worked out and lives up to its full potential but I can't recommend this half-baked version. Rated 3 out of 5 by toyamadison from No Cooking Involved I didnt like it much. I thought that there would at least be a little cooking. Rated 3 out of 5 by ntelinasia2 from Boring to me Well,if you like strategy games,it's good...what you have to do is to create and run your restaurant(s).In my opinion is soooo boring,I played for about 1 hour and I run out of money...Tutorials were helpful but so long as well,I felt like they would never end!Oh,and I should not forget to mention the colours...nice graphics...really cool...but the colours were not so lively as I expected.Oh,and you don't have to cook actually as I thought...you are just the owner...It's so anoying that generally I love strategy games and it's a piece of cake to me but this one was...oh!I just let my sissy playing it!She finds it very good although...I don't really know why!Trust me,"zoo empire"is much better! Rated 3 out of 5 by aaronlt from Standard Tycoon Game The game isn't very challenging or fun. It's kind of slow and the game's textures are pretty bad. It's not really worth paying full price for, but if you really want to give it a try, bear in mind that you're not going to be doing much other than wading through dialog, opening and closing your store, decorating, hiring better staff, and occasionally doing a small event. In short, it's a basic tycoon/simulation game. 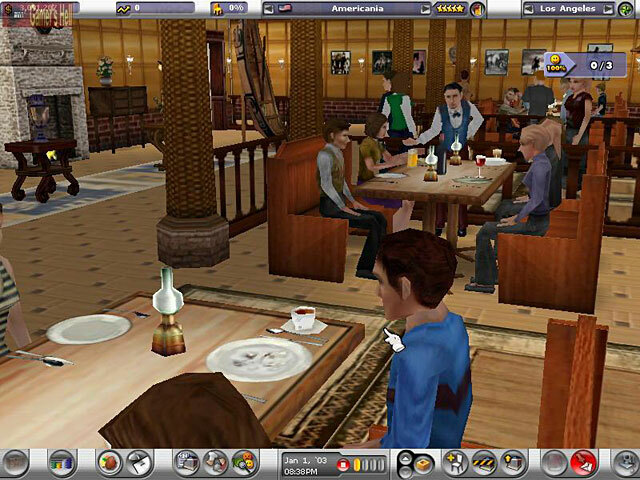 Rated 3 out of 5 by FamousAdventurer from Good gameplay but loaded with design flaws If you like cooking games, sim games, and are looking more something less casual and more intense, Restaurant Empire seems like an excellent title-- it has a lot of aspects I really enjoy such as picking out recipes, the minigames in the story mode, and decorating the restaurant. But it's loaded with design flaws in that there is no way to really address customer complaints or control the food quality. The sandbox mode also just lets too much happen at once while the story mode is incredibly limiting. All in all, it can be a fun play if you have cheat codes but has too much going on at once for the casual gamer while the seasoned gamer will get turned off by design flaws. Rated 2 out of 5 by 50Squirrels from Outdated, Not Recommended Complex, challenging and rewarding. Note that you have to play through all the tutorials to learn everything, so ignore complaints like rude servers until it is covered. This must have been a great game when it was released, but now it is so outdated that I cannot recommend it. The graphics are bad, the controls are annoying, and the mini-games are not fun at all. 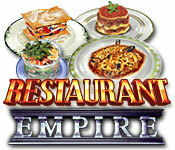 Hopefully Restaurant Empire 2 will be available here soon - I know I will play it! Rated 2 out of 5 by apple43 from Challenging to Navigate I agree with the other reviewer who found this difficult to navigate. This is the first time I purchased a game without the free trial and I won't make that mistake again. I consider my gameplaying skils to be on the intermediate level, but was frustrated even going through the tutorial. Rated 2 out of 5 by kristin6028 from Really hard to navigate I don't usually like games like this, but I thought I'd try it. If I'd known about the 360 navigation, I would never have gotten it. For me, that makes it frustrating to play as it's difficult to position the view the way you need it. I also agree that there are way too many buttons and sub-features. Rated 2 out of 5 by Tracy7972 from Don't waste the credit Very dry game overall. The days are too long, and it is too challenging to keep your customers happy. Also, the tasks are difficult to access much less accomplish. Rated 1 out of 5 by jacobmommy from Awful Game!!! I own over 250 Big Fish games and have tried over a thousand, and this has got to be THE WORST GAME I HAVE EVER PLAYED!!! The tutorial feels more like one of those required educational videos professors make you watch... Long and boring! yawn!! The controls are confusing and have a 1995 Windows feeling to it. It desperately needs to be upgraded, which is surprising since the game was created in 2007. The excitement level - I rate a 0! If the game was more challenging than nonsensical then it might have wiggled it's way to a 2 star review, but it's complete nonsense. And something I have NEVER SEEN IN A GAME EVER is this games deliberate exclusion of female players. 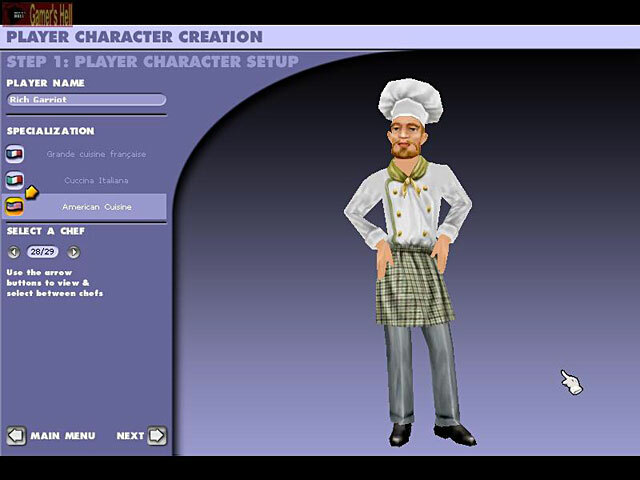 The game has all 32 chefs male (but 1#, and almost all other higher level characters #paid, experience, etc.) are male as well. The female characters - waitress and receptionists. Pathetic! Rated 1 out of 5 by Kristi999 from Big Regret On This Purchase The game description sounded great. But, no free trial. I bought it anyway... big mistake. My big complaint is the 360 navigation, runs choppy, it's awkward to navigate. I spent most of my time trying to get the view I needed to even see what I was doing. Because of the navigation problem, it was way to time consuming to even get familiar with this game. Everything takes waaaaay to long. I will never buy a game again unless it has a free trial. According to the description my computer fit the minimum requirements. I think this game has some serious flaws. I didn't like the graphics either. Rated 1 out of 5 by aehardy from Waste of Money/Credit I really wish they had a trial for this game because I would not have wasted my money. The game does not run smooth and is awkward to play. There is no direction to what you should do and the tutorial is useless. Rated 1 out of 5 by jdtwilliams from One slow, overly clicking game! Too many turns, how to turn, clicking, one feels like then in school all over again. A truly painfully hard to handle when your using the mouse. Boring to the end. Its a challenge if ones wants a headache. I wasted my money on this one. Blah! Rated 1 out of 5 by nikiaresca from To complicated! I have played so many games but this game is way to complicated, to many buttons, you want a challenge but there way to many buttons and things to learn, u supposed to relax and enjoy a game not feel like you studying!